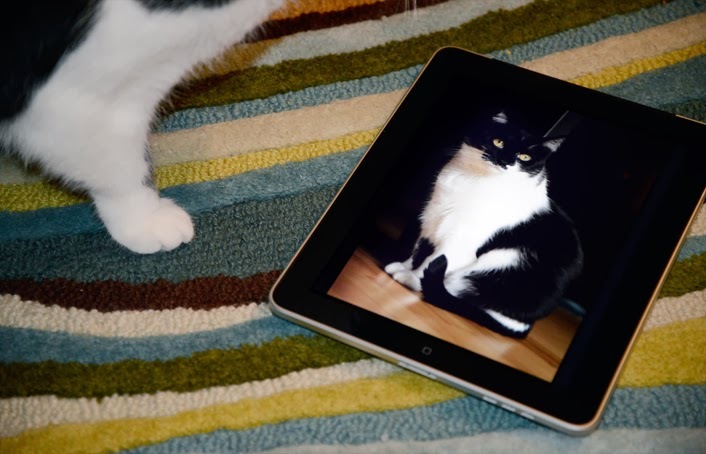 GLOGIRLY: What's YOUR Favorite iPad Game For Cats? Until today. Gloman got a new iPad for work, which left it's predecessor up for grabs. I called firsties. Glogirly says I can have my very own game, but I've never played an iPad game before. So I need your help! 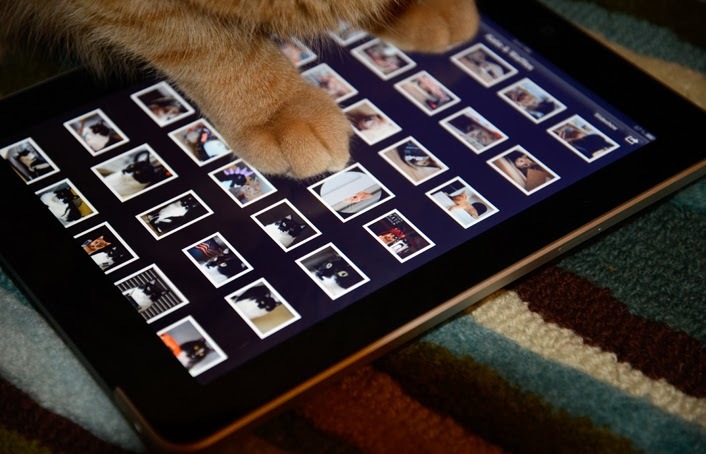 If you're an iPad kitty, please let me know which game is YOUR favorite. I've got some app shopping to do. That is once I figure out the parental controls on this thing. I'm particularly interested in locking out anyone with orange, sticky paws. Surely there must be an app for that. we dunna haz no apple gimmicks but our favorite app on That Woman's touch screen lappietop is the one that makes her go 'Oh you have GOT to be KIDDING me!" which is usually followed by 'I'd better not be finding any peedrops on my shiny or I'll be sellin some kitties by the pound to certain parts of downtown LA!" We have Jitterbug Happy Wings & Cat Fishing. Jitterbug is the best. No one here even has an iPad! Goats do apples. They want the WHOLE fruit. I hate to admit this, but none of us here are gamers. Boodie has half an interest and that's it. 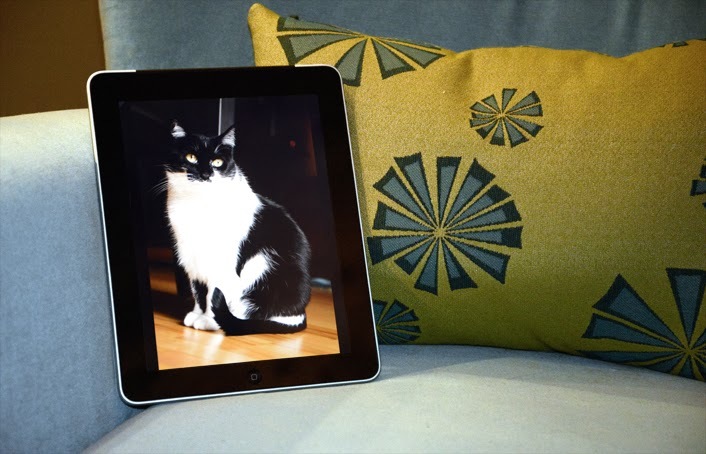 Even worse, my human named the iPad "Sparkle's iPad." In fact, maybe that's why I've rejected it. Us kitties can play games on those pad thingys? We gotta have a serious talk with our mama. Cat Fishing! It's gotten so bad that every time I bring out the iPad, Ruby thinks it's for her :-). She's obsessed with the game. There's a paint app for cats. It's not free, but it's only a couple of green papers so we got the mom to spring for it. We can paint cool pics and save them! We're all budding piCATsos! I love Paint for Cats but mommy is afraid my clawsies will scratch the glass. We don't have any of that stuff at our house. Sorry. Mommy can't afford that kind of stuff (although she wishes she did). Animal Planet on tv and cat blogs. That's my entertainment. And mommy. Sometimes she is really entertaining. Like last night when she spilled the stew she made. Only Mom gets her paws on the iPad! All we have is a cheap cellphone for emergencies. Sorry we can't help you out with any app suggestions. Hi Katy, this is Lulu. I heard Valentina ask Z-Girl if SHE could have an iPad. We all heard that Choupette, Karl Lagerfeld's kitty has one. She uses it to tweet. Who is this guy Santa and why does he have claws? I have a Tab3 Tablet but I don't know if I want Molly Mew to touch it. Ma says I have to share but I say I share everything, my food, my treats, my clothes and even my hair bows so I think there should be just one thing I shouldn't have to share.That would be my tablet. I did have a kitty game on my phone but since the screen is only 3" Molly Mew couldn't figure out how to sit on it and play. I look forward to seeing what your readers say because sometimes poodles like kitty games too....Just saying. Wubbikins LOVES the "paint for cats" app! She has been playing it (and chewing on my iPad) since she was about six weeks old! We are curious … our mommy needs to put some apps fur us on her iPad. Oh Katie - M is drooling over your Ipad. he he - she doesn't have one and would like one. Afraid we can't help you any. You are one very lucky kitty. I used to be into Paint for Cats; in fact, I created some masterpieces that were auctioned off for charity. I outgrew it. Same with the Friskies games. Lately, TW has been doing that Temptations thing that you blogged about years ago and getting me excited. I play games on my mom-persons Andriod Tab now and then.